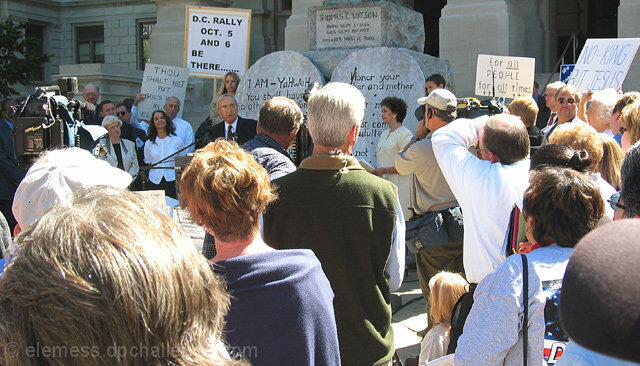 At the Atlanta, Georgia, Christian Coalition gathering in support of displaying the Ten Commandments in public places. Congress shall make no law respecting an establishment of religion, or prohibiting the free exercise thereof; or abridging the freedom of speech, or of the press; or the right of the people peaceably to assemble, and petition the Government for a redress of grievances. I guess they got confused. Good color, I like the light. The judge and the 10 commandments? Hmm. Could be ironic, but the rally itself suggests that there is still freedom to speak. Great timing and interpretation. Nice shot. Some folks will shoot you down though. So the 1st ammendment prohibits state sponsored religion. Why is that ironic? I don't really know what the title means and how it fits to the photo. An amendment is a change to something right? If there is irony here I am too silly to get it :-) So I'll take your word for it. I live in Montgomery, Al. so this photo for me really hits home. I find irony in a nation that takes God our of it then wonders where things went wrong. Nice idea and well done for the topic ! Proudly hosted by Sargasso Networks. Current Server Time: 04/19/2019 04:15:25 PM EDT.